Nur wenige Minuten vom berühmten 7 Mile Bridge 'und durch den Atlantischen Ozean umgeben ist, lädt Sie das ruhige, tropische Insel zu bleiben, mit seinen Palmen, funkelnde blaugrünen Wasser und einem entspannten Lebensstil. Wir sind stolz auf unser Ferienhaus. Alle wurden aufgrund von Irma neu gestaltet, hübsch dekorierte neue Möbel, Sessel, großer Flachbildfernseher, makellos und komfortabel mit Fliesenböden, Granit-Arbeitsplatten, Küchengeräten aus Edelstahl und extra großem Wohnbereich. Komm schau dir eine Florida Keys Sonnenuntergang !! Pool, Whirlpool oder Jacuzzi, Gasgrill, 3 Fernseher, Angeln Tisch, Ködergefrier Cabana Club ist private Meer Strand. Love this area. The duplex is very nice.Especially liked the layout. Nice being on a canal,plus you have the option of the ocean at the Cabana Club ,Havana Jacks and the Sunset celebration at the pier on Sunday nights was very cool. Would definitely give this place a thumbs up ! We greatly enjoyed our two week stay in Key Colony. The house was very comfortable with lovely outdoor seating on the canal. We especially enjoyed having our breakfasts and dinners outside! Indoor accomodations were comfortable and nicely decorated. The location was super, within short distance to the Cabana Club and Sunset Beach where nightly celebrations are held at sunset. The Cabana Club was very nice and offered entertainment several nights a week. Linda, the owner, was easily accessible for questions and promptly cleared up a mixup when we were erroniously charged a pet fee. The only recommendation I would make is to replace the air conditioner in the first bedroom as it has a mild musty, moldy smell when the fan is on. I would definitely return if I were coming back to the area. I cannot say enough positives about the owner! I have never met the Linda but she is just wonderful to deal with. Through the booking process to checking in and check out. We had a little issue with the cleaning company at check-in but Linda addressed it and dealt with it right away. The house itself is wonderful. The kitchen is well equipped and large enough to do any cooking you would want to do. The living room is comfortable and welcoming. Both bedrooms and baths are very comfortable and accommodating. One bedroom as one queen bed and the other has two. The back patio overlooking the canal is BEAUTIFUL! We enjoyed it every night. You won't be disappointed in this home! Happy vacationing. The house was everything we expected. All the comforts od home. Great location. Plan on comming back. Key Colony Beach is a beautiful place, we had very good time in Linda's house. A big and clean house. Just one point for the bedroom in front, some curtains are missing to have dark for a good sleep. And good situation in the Keys to visit North or South. Fall discount .Multi week discount .. Full hurricane refund. Security deposit is forfeit if cancellation occurs after 60 days before arrival date .Please no booking more then 365 days in advance. All guests shall abide by the rules and regulations of KCB as posted inside of rental.A local property mgr. 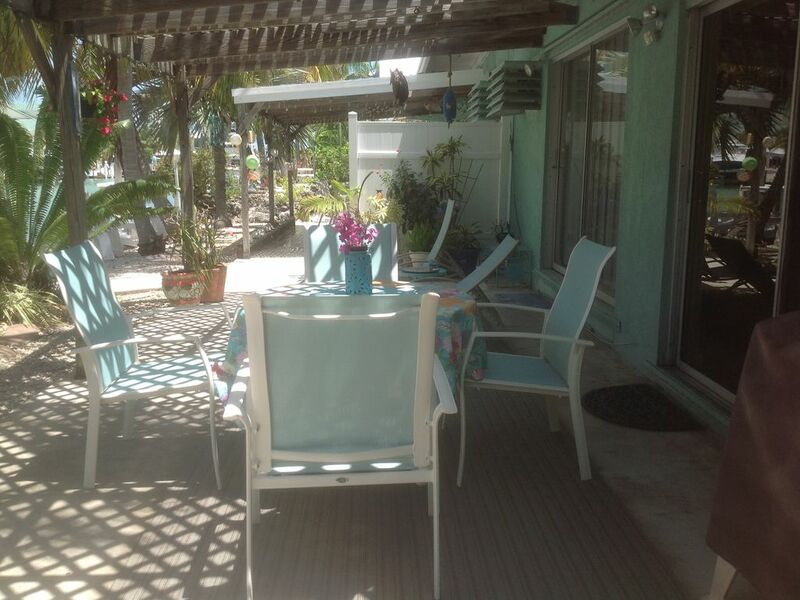 is available if needed.All guests required to enjoy the keys.